Auto deductible reimbursement is an optional type of protection offered by certain car insurance providers. It's a low cost way for a driver to avoid paying money out-of-pocket after an accident occurs. An auto insurance deductible is the amount that a policyholder agrees to pay personally when he or she makes a claim against a policy. Insurance companies typically reward customers who choose to pay a higher deductible with lower premium rates. When a policyholder makes a claim under the collision or comprehensive portion of the insurance policy, the deductible must be paid before the insurance company will pay for the damages. Collision coverage pays out when a vehicle is damaged due to striking another vehicle or following a rollover accident. 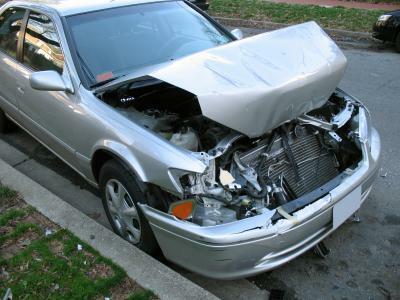 Comprehensive coverage pays for damage to a vehicle caused by something other than a collision. It pays for damage caused by hitting an animal, hail, flooding, acts of vandalism, or fire. This part of the policy also pays out when the car is stolen. A policyholder can typically choose a deductible at a level from $250-$1,500. Choosing a policy with a higher deductible will usually bring premiums down, but a policyholder must choose the level carefully. It's important to set this at a level that will not cause financial hardship after an accident occurs. A policyholder who has auto deductible reimbursement in place has coverage that will pay up to a set amount (usually $500) to cover the amount of the deductible. The policyholder can take advantage of lower rates on his or her coverage while not having to be responsible for paying the full amount personally. The individual who is shopping for coverage still has the option of choosing a policy with a deductible that is higher than $500. The deductible reimbursement will not pay the entire amount of the policy deductible. A person who is comfortable paying a $500 deductible can arrange for deductible reimbursement coverage and buy a policy with a higher one and pay lower premium rates. An individual who is interested in putting auto deductible reimbursement protection in place can do so by asking his or her insurance company to add it to the policy or buy it as separate coverage. It's a good idea to shop around and compare coverage rates before making a purchase decision. Before choosing a company to provide deductible reimbursement protection, a consumer should compare options carefully. Some companies offer coverage for two years at a time and the prospective customer should make sure that he or she is comparing options with similar coverage terms before making a final decision. Customers should also make sure that they understand when the coverage actually starts. There may be a delay between the time the customers enroll in the program and when they can make a claim for reimbursement of the policy deductible. This type of protection should follow the driver, which means that it should extend to a second vehicle.